Deadline is 8/1 for Scholarships. 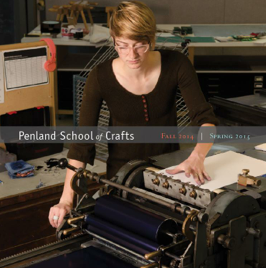 Open for registration: Penland’s eight-week workshops–the length of a semester, with the intensity of total-immersion. By pursuing a single subject for two months, students have a chance to be part of a community of artists, receive college credit if desired, and make great strides in their work. Please forward, post and share this opportunity with anyone who may be interested. Deadline for fall scholarship (and some spring scholarship) applications is AUG. 1. Come indulge in a variety of techniques and treats for your ceramic surfaces. Our menu offers demonstrations for both on- and off-wheel pottery construction. All levels. Beginning students will develop a confidence and professionalism while building a technical foundation; intermediate and advanced students will expand and refine their hand skills while focusing on the development of their own design- and concept-based works. This workshop will use the entire iron studio–with instruction in blacksmithing, welding, and fabrication–to push the limits of drawing in steel. All levels. Through hands-on investigations, students will focus on incorporating color into their jewelry, using a variety of methods to create color on metal including enameling, resins, patinas, colored pencils, and powder coating. All levels. This workshop will cover all aspects of working with encaustic paint, with a special emphasis on combining encaustic with mixed media. All levels. Through demonstrations, practice, and discussion, we’ll cover the basics of the four main print media: relief, screenprinting, intaglio, and lithography. Then each student will choose print processes or a realm of inquiry to explore in depth. All levels. This workshop will explore the natural-dye process in depth, using plants, extracts, and earth pigments. Students will experience the many ways natural dyes can be used for textile art and develop a personal natural-dye color palette for wearable art, quilts, or wall pieces. All levels. We also have several one-week workshops in the fall. Scholarships are not available for one-week workshops.